Lexar Professional 1000x SDHC/SDXC UHS-II cards let you quickly capture and transfer high-quality photos and 1080p full-HD, 3D, and 4K video, with a read transfer speed up to 1000x (150MB/s). * The cards leverage UHS-II technology (UHS Speed Class 3 (U3)) for high-speed performance. This dramatically accelerates workflow from start to finish, so you can save time and get back to the business of photography. 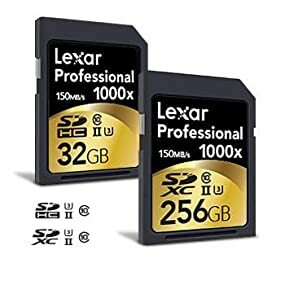 Whether you’re a professional photographer, videographer, or enthusiast, Lexar Professional 1000x SDHC/SDXC UHS-II cards provide performance you can trust. These high-speed cards leverage UHS-II technology (UHS Speed Class 3 (U3)) and provide a read transfer speed up to 1000x (150MB/s) when used with an SD UHS-II reader. For versatility, the cards also work with UHS-I devices at UHS-I speeds, and they’re backwards compatible with older cameras and readers, performing at Class 10 speeds when used with non-UHS devices. Using a DSLR, HD camcorder, or 3D camera, you’ll be able to leverage the latest photo and video features available for shooting high-quality images and stunning 1080p full-HD, 3D, and 4K video. Professional 1000x SDHC/SDXC UHS-II cards include the latest version of Image Rescue software. Image Rescue recovers most photo and select video files, even if they’ve been erased or the card has been corrupted. *** The software is available for free download with purchase of the card. **Highest transfer speeds achieved only when paired with an SD UHS-II reader.